We bring you some highlights of the 34th Discovery Conference of the Alzheimer's Association Washington State Chapter, from talks presented by UW Memory and Brain Wellness Center team members. 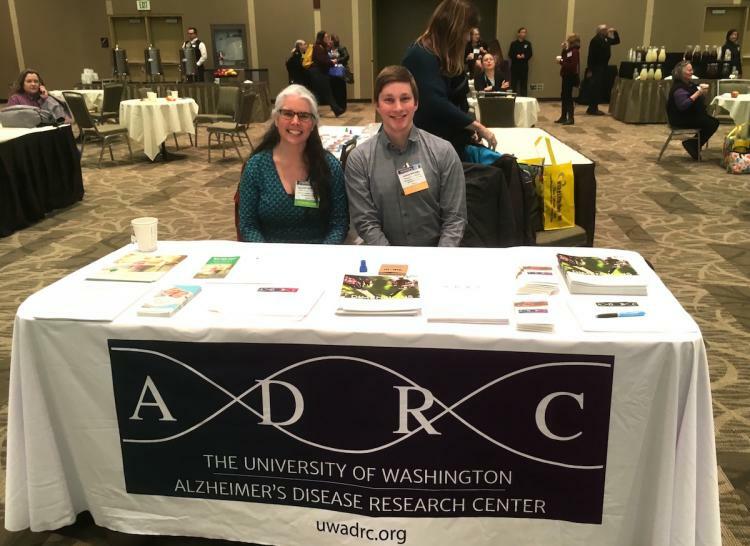 This year, ADRC Clinical Research Coordinators Jessica McDougall and James DeLappe spread the word about the community programs of the UW Memory and Brain Wellness Center and the research activities ongoing at the Alzheimer's Disease Research Center. If you missed it, you can learn about enrolling studies and trials here, and sign up for our monthly newsletter and/or bi-annual magazine here. Dr. Thomas Grabowski, MD, Director of the UW Memory and Brain Wellness Center and the Alzheimer's Disease Research Center, clarified common confusions around Alzheimer's disease and dementia. Alzheimer's disease does not always mean dementia; Many people who have the microscopic changes of Alzheimer's disease in the brain don't have, or may never progress to, dementia symptoms. He noted that for every patient with dementia due to Alzheimer's disease, there are two more people with pre-clinical Alzheimer's disease; About 25% of 70 year olds have preclinical Alzheimer's changes. In fact, Alzheimer's disease can develop 15 years before mild cognitive impairment (early signs of change in thinking and memory) onsets. Dr. Grabowski sees this time as a window for intervention in which brain health can be supported by lifestyle changes, such as exercise. This discordance between Alzheimer's (neuropathological) and dementia (clinical) explains the need for the new definition for understanding this disease in the research world, which radically respects the difference between disease and syndrome. In this new NIH framework, research participants in ADRC studies will be categorized by biomarkers, or measurable characteristics that signify disease, such as imaging tests and blood or spinal fluid protein levels. In this way, researchers will have a systematized way to study preclinical Alzheimer's disease. They can define biological states that can be targeted by intervention. Additionally, researchers will be better able to identify and study resilient people—people who have significant Alzheimer's changes, but do not show symptoms. Dr. Grabowski noted the drawbacks: Even though this framework is meant only for research, it may be impossible to keep it out of the clinical world in the information age, and there is pushback around the idea of diagnosing asymptomatic people with Alzheimer's changes. Dr. Grabowski also announced major promising results in use of a blood test (Ovod et al. 2017) and synaptic PET scans (Chen et al. 2018) for detecting Alzheimer's diseases and tracking progression, as well as new evidence to suggest that epileptic-like activity in the brain, sleep apnea, and sleep disorders may contribute to the progression of Alzheimer's disease, but he noted that these are also treatable risk factors. Kristoffer Rhoads, PhD, a neuropsychologist at UW Memory and Brain Wellness Center, joined a panel of his colleagues to share the newest advancements and plans of the Dementia Action Collaborative, a group of public-private partners committed to preparing Washington state for the growth of the dementia population and building consciousness of dementia into primary care practice. The panelists included Bill Moss (Chair, Dementia Action Collaborative), Bob LeRoy (Executive Director, Alzheimer's Association WA State Chapter) Cheryl Townsend-Winter, DDS, MSD, MBA (State Council on Aging), Maureen Linehan, MPA (Board Member, Alzheimer's Association, Generations Aging with Pride), Lynn Korte, MPH (Aging and Long-term Support Administration). One of the DAC's main goals is to identify and endorse evidence-based standards for primary care practice. As the number of people living with dementia increases 181% by 2040, primary care practitioners will need to shoulder more and more dementia detection and provide guidance for families. 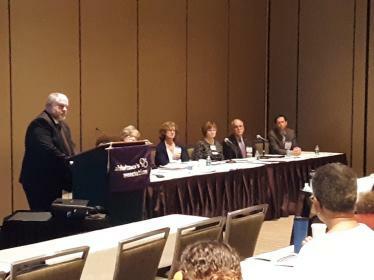 The panel highlighted the DAC Clinical Provider Practice Tool to give clinicians a guide on the steps to take after a patient develops concerns or signs of possible cognitive impairment, including diagnostic and referral guidelines for specific neurodegenerative diseases, medication best practices, and management resources. 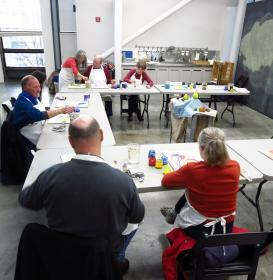 The tool also recommends that clinicians offer people ways to maximize their function and stay engaged in hobbies and activities. For example, the tool suggests providing people to the Living with Memory Loss: A Basic Guide, produced by our team at the UW Memory and Brain Wellness Center clinic, specifically for people living with a diagnosis of dementia or mild cognitive impairment. But how will DAC encourage clinicians to focus on early diagnosis and support? The future plans of the DAC, which will cost $5.4 million, include spreading such dementia care best practices to primary care practitioners through the tele-health platform Echo, which will allow remote communication between groups. They will also develop a dementia care specialist program to offer services to families in specific areas; promote public awareness through evidence-based and culturally relevant messaging around aging and dementia; and promote advance care planning. To highlight existing public information, the panel announced memorylossinfowa.org a resource of Washington State’s Community Living Connections for the local public offering information and resources on memory loss and Alzheimer's and dementia, including detailed sections on driving, long-terms support and services, caregiving, medical and safety, issues, and legal/financial. Also available is the Dementia Road Map: A Guide for Family and Care Partners. For a paper copy, please send your name and mailing address to dementiaroadmap@dshs.wa.gov. In the Fall 2018 edition of Dimensions Magazine, our center highlighted a new collaboration funded by the UBC Cascadia Engagement Fund to bring people together to learn about creating sustainable dementia-friendly communities. Researchers from the University of British Columbia are learning about the Seattle Momentia grassroots movement, and the UW MBWC team are building a better understanding of how different communities can manifest a new vision of social belonging for people with dementia, through community action and innovation. The team attended the Discovery Conference panel to provide an update. They also announced their 5-year plan to complete their vision to establish final guidelines to support social citizenship and impact measures, in partnership with community groups and people with dementia. The project, Putting Social Citizenship into Practice: Reducing Stigma and Promoting Social Inclusion for People with Dementia, starts with recruiting an action group of citizens to decide on a working definition of “social citizenship.” The group with conduct research with—not on—people living with dementia, to establish approaches for community programs to support social citizenship. They are funded by the Canadian Institutes of Health Research, and will partner with the Alzheimer's Center of BC, Center for Applied Ethics, and The UBC Center for Research on Personhood in Dementia. The also gave the audience a teaser for a party to be held in July on the BC side of the border, called Dementia without Borders: A Party at the Peace Arch. Stay tuned for the details to be posted on this website! At the Discovery Conference 2019, the MBWC's Marigrace Becker, MSW, held a workshop for people living with early stage memory loss interested in becoming community advocates and participating in dementia-friendly communities, and Michael Persenaire, MD, gave an overview of non-Alzheimer's causes of dementia. Please find resources at our partner associations for: Lewy Body dementia, frontotemporal dementia, and Parkinson's disease. Thank you to Elisabeth Lindley, registered nurse practitioner at the UW MBWC clinic, who worked on the 2019 Planning Council to provide input on the topics for this year's Discovery Conference.